This is the electronics market prediction for Russia, circa 1966. It was part of a comprehensive assessment by the editors of Electronics magazine of the state of commercial, military, and consumer electronics at the end of 1965. Then, as now, Russian electronics products are not considered to be serious competition to U.S. markets. For that matter, when is the last product of any type you bought with a "Made in Russia" stamp on it? Even though the Soviet Iron Curtain fell in 1992, very little progress has been made with mending fences with them. Unless you can find a news story on the state of the industry, detailed reports must be purchased from research companies like Statista. Their website has a lot of charts on Russia's current electronics market showing revenue in the consumer electronics segment amounts of US$2,942M in 2018. The Soviet consumer electronics industry is far from primitive; however, for the foreseeable future the Soviets will offer no competition to Western producers. In fact, Russians will remain hungry, even starved, for Western imports. This is the image emerging through the static of military secrecy and statistical reports in which electronics is not treated as an industry at all. "Yes, but they're beyond the Urals." That's Russian slang for "military secret." It was the Soviet space program that released some facts on the country's electronics industry. Manned sputniks, moon shots, and deep-space probes told much that was new. It's been demonstrated that the Soviets no longer are counting on the cushion that large booster rockets gave them in the early days of space exploration. The move is clearly toward denser electronic packages, though not necessarily toward American-style microminiaturization. The Soviets, apparently, will always favor the big power pack. This year the Russians brought back 1,100-line pictures of the far side of the moon from a distance of several hundred thousand miles. Earlier they orbited a communications satellite with 40 watts of power, or ten times that of Early Bird. They claim they'll be able, shortly, to broadcast directly from an orbiting satellite into community television antennas. And they've announced their soft-landing Luna package which contains radar plus a computer complex to measure distance to target, compute optimum time for retro-fire, and give the firing order. Increasing complexity of the Soviet space effort indicates substantial solid state computing power on the ground, though it is apparent that none of this hardware has become available to the civilian industry. The Russians continue to claim superiority in computers, but they make no secret of their desire to buy Western models. Recently a group of visiting American businessmen were asked to evaluate the possibility of holding an American computer and industrial electronics exhibition in Moscow. British companies, led by Elliott-Automation, have been selling industrial-process computers and instrumentation to the Soviets for several years, and the general belief is that relaxation of controls by the West would lead to a flood of such sales. Meanwhile, the Russians are showing signs of putting heftier budget sums into civilian electronics research. Last summer Moscow sponsored a month­long exhibit of Soviet and East European informa­tion equipment at which it was learned that prog­ress has been substantial. 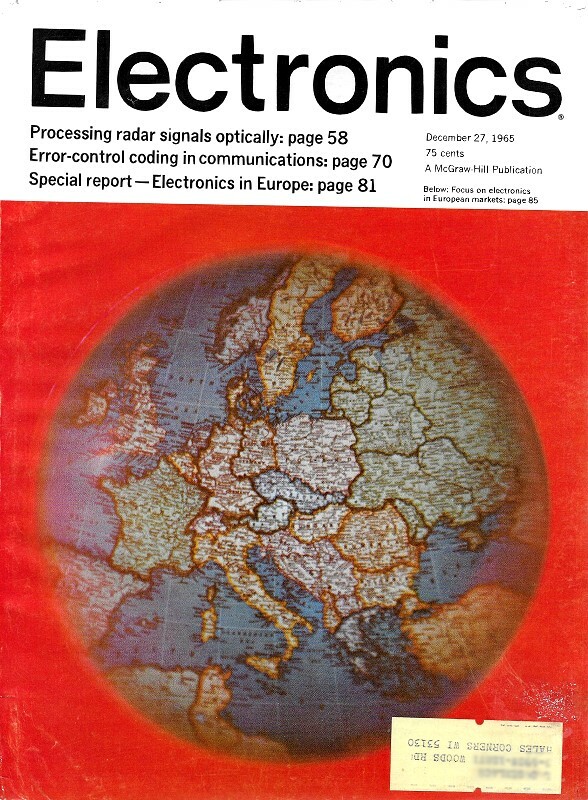 The Soviets are now working hard to develop a common computer language and common components standards for Eastern Europe, and within a few years they may achieve success. In their civilian applications the Russians have now reached the point of full transistorization with modular sections, but they have yet to apply molecular or integrated circuitry. They appear to be about one generation short of Western achievements. They've developed random-access retrieval systems along the lines of American devices of 1959 and 1960. On the purely consumer electronics front, progress has been much swifter, relatively. Within the past 12 months the Soviets have put transistor radios, modern-styled television sets, and portable phonographs on the market. Now they've agreed to use the French Secam color-television system, with "commercial" broadcasts scheduled in 1967. Radio and phonograph production actually declined between 1963 and 1964, from 4,800,000 to 4,750,000. Television-set production inched up from 2,470,000 to 2,920,000. The production for 1965 increased slightly. For the first three quarters, tv set production was up 22% and radio and phonograph production up 7% according to official statistics. The Russians don't import any consumer electronics, and have no plans to do so. Electronics export figures show that the Russians are caught up in worldwide price trends. Exports of 72,400 radios in 1963 were valued at just over $3 million, or $40 each. But last year 111,300 radios exported cost an average of only $20 each, for a net decline in foreign exchange of about $800,000 - on nearly 60% volume increase. Reprints of this report are available. Use the reader service card at the back of this issue.